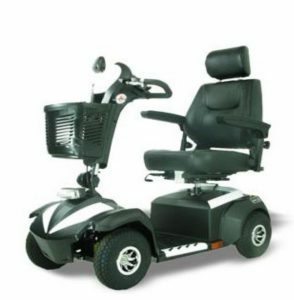 AGIS L10 luxury large size mobility scooter is equipped with a captain seat and 10” black air-filled tyres with sports rims. AGIS L10 luxury large size motorised scooter is capable of travelling up to 45km and its weight capacity can carry up to 160KG. AGIS L10 motorised scooter has all the features of a luxury scooter with digital control panel, front LED headlight, signal lamps, rear view mirrors, suspension and a large basket.